When a werewolf transforms into Gauru they get a stat based increase in strength of 3 dots and a size increase as well. What does this do for my character that wants to throw around as much as they can as improvised weapons? I see a lot of references that "Gauru can easily flip a car", but if my character has strength of 1 then that's not going to work. Even when I hulk out my character would only have 4 strength so I couldn't preform huge feats of strength. Or is that tied to the size increase in some way so that changing to Gauru affords me some extra perks when it comes to goofing around at full size and strength? Also what Strength would be minimum for tossing the average car? 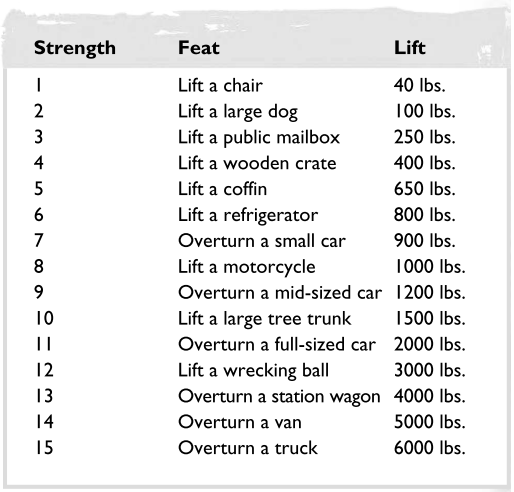 Here's the original Strength chart for first edition. As far as I know it hasn't been updated to second, so may as well stand. The accompanying rules say these things can be moved just by spending an action, with no Strength roll necessary. 'To exceed the limit, a Strength + Stamina roll is required, with successes achieved added to your character's Strength score to determine what kind of task he can accomplish.' And skipping a little ahead, 'If your character's modified Strength total exceeds that required to lift an object, it can be relocated as desired.' Which I'd take to mean thrown. There are some more rules for Throwing objects, I believe it gets limited by Size or something. But judging by the list you would need a Strength 8 Gauru to easily flip over a car, but Stamina can help with that, and Gauru offers +2 Stamina. If you want to empower your gauru form, or another form, you might look to Merits like Favored Form, Fortified Form and Living Weapon. Also Gifts like Slaughterer and Rending Claws. Offhand, I don't believe Size has too much influence on mechanics of things you can do beyond being large and defending against certain Size-based abilities. Last edited by nofather; 12-10-2017, 03:10 AM. When you lift an item you can roll stamina + strength + equipment (e.g.gauru claw grip) -penalty (e.g. lack of handles), success increases the chart given above, or simply the size of the item you want to lift, so a strength 6 gauru may lift a car with 3-4 successes on a stamina + strength roll, the next turn he will need to roll dexterity(or strength) + athletics + item size to throw , so a gauru with lets say strength 6 and athletics 2 will roll 8 - 1 (improvised weapon) - enemy defense= successes + 7 lethal damage, unlikely to hit anything but still can be achieved with willpower and all-out attack. Though a car may not be thrown since its heavier than the normal werewolf gauru strength, but it can still be used as a ''club'' for a turn, or in order to throw it 3 foot in front of him/her and hit an enemy. Last edited by Story Letter; 12-10-2017, 04:34 PM.